Even though I’m a noodle arm – or maybe because of it – I’ve always had a thing for putters. Truth be told, a lot of it has to do with plastic addiction; trying new discs is part of the fun for me, and putters are usually on the inexpensive side of the purchase scale. Even more of it has to do with equating my poor putting to the arrow rather than the archer. Why take the time to learn the putter I have when there is probably a better one out there, right? I know, not exactly the most responsible take. No matter the reason, it adds up to this: In my four years of disc golfing, I’ve used 18 different putter molds. Eight. Teen. I’m determined to make number 19 the last one, though. It’s something special. Billed by MVP Disc Sports as a “straight-stable putt and approach disc,” the Atom is not only the company’s first putter offering in nearly three years, but is also the initial mold run in Electron plastic, a baseline-pro material available in two flexibilities. Based off of the low-profile core of the successful Envy (from MVP’s stylish alter ego, Axiom Discs), the Atom feels sleek in the hand, with minimal depth and a flattened edge that begs for speed. It was no surprise, then, that when I got the Atom to the course, it absolutely excelled off the tee. 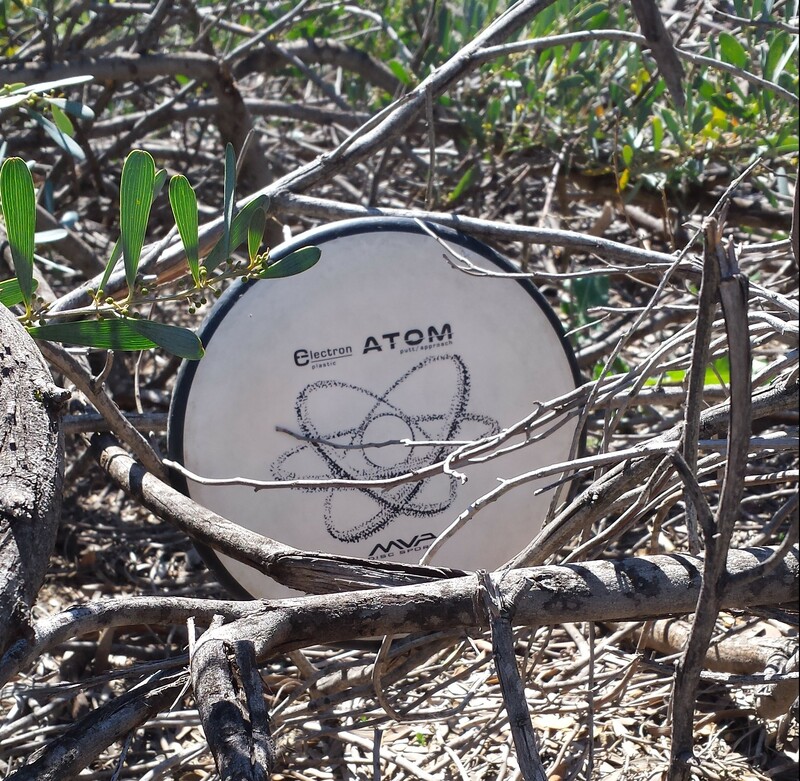 The Atom is a “straight-stable” putt and approach offering from MVP Disc Sports. For lack of better comparisons, I’d say the Electron feels close to the Zero Medium/Classic Blend/BT Medium family of plastic coming out of Sweden’s Latitude 64 factory, with Electron Soft lining up closer to its Scandinavian brethren’s soft blends. There’s a distinct difference between the companies’ offerings, though: To me, the MVP baseline has a more appealing tactile feel that almost has a sheen of silicon, lending a bit more chalkiness; the Latitude blends feel more rubbery. A more important observation, though, relates to MVP’s signature overmold. On both the Electron and Electron Soft, the overmolds are relatively firm in comparison to the flight plate. It gives both discs a distinct rigidity; using Electron for drives and Electron Soft for hit-and-stick shots, for example, won’t be required. Still, putters and plastic preferences are such a personal choice that I hesitate to tell you to choose one over the other. If you’re on the fence, just remember: evil villain petting a cat. You can’t really go wrong. For putter testing, there is a perfect pitch-and-putt course located nearby – Montiel Park – that really allows me to get a feel for all facets of a new mold. The holes are long enough to air it out, but short enough for a putter; it sits on a relatively exposed hillside, which covers elevation and wind factors; and it features plenty of dirt and rock to really put new plastic through the ringer. This last part, given that MVP was debuting a new, lower end plastic, was going to play a big role in my feelings about the the disc. After the first round with the Atom, though, I was already swooning at the potential of it earning a full time spot in my bag. It ate that pitch-and-putt alive. Thrown with a touch of hyzer, the Atom would flip up to flat quickly, then ride a lazer straight flight with a baby fade at the end. On the uphill shots, I had no problems putting the Atom pin high by just giving it a little more air. The downhill holes, though, are where it really shined. Hole 8 at Montiel, for example, is measured at 336 feet and sports a nice drop off. Normally I throw a midrange off of this hole to get a little extra distance, but also because if I inadvertently torque a putter and it turns over, it is going to sail over an out-of-bounds fence off to the left. The Atom, though, wanted nothing to do with torque or out-of bounds. Instead, it flipped up, displayed monster glide and landed pin high about 15 feet out for an easy birdie. I normally don’t park that hole with a mid, let alone a putter. I was sold. The plastic also seemed to hold up well. Sure, there were some dings and scuffs on the rim, but that will happen with any baseline plastic. The most important aspect was that, despite the cosmetic evolution, I was not seeing any loss in stability or change in flight characteristics. Still, one round is generally not enough for me to bag a mold, so I had to continue to put the Atom through its paces. As the rounds wore on and I kept the Atom around for testing, I found myself reaching for it more and more. Short tee shots with limited canopy? Atom. Long approaches with danger on either side? Atom. Every. Single. Upshot. It was even useful for getting out of bad lies when the line called for it. It was proving the be an incredibly user-friendly mold, in that when I needed to use it, it generally treated me like a friend. Hole 17 at Kit Carson Park requires a high anhyzer shot for a lefty, and the Atom is game for the challenge. And now that I have been bagging it for nearly two months, my confidence with it is sky high. Three shots, in particular, stick out when I think back to how it gained this trust. The first was Hole 8 at Brengle Terrace Park. Another downhill shot, this one is particularly tricky for a left-handed thrower like myself. If I throw something too understable, I turn it over and have a difficult anhyzer approach downhill to save par. Throw something too overstable, and it fades down the same hill, leaving me with a long, uphill battle. Oh, and it often has a crosswind flowing through the valley that the shot covers, which you often can’t detect from the tee. This hole has literally vexed me for the two and a half years I have been playing the course, and the Atom has solved it. Tiny hyzer, flip it to flat and let it glide with a soft finish near the basket. I don’t always hit the putt for birdie, but it’s been awhile since I’ve bogeyed it, either. 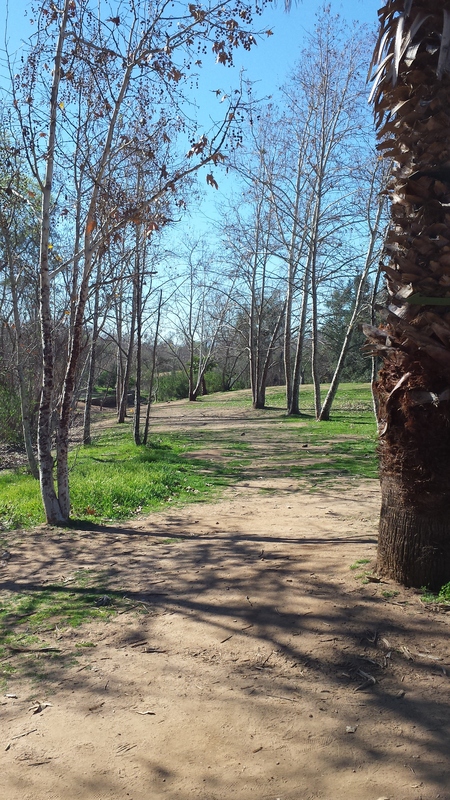 The second shot that stands out in my Atom courtship belongs to Hole 17 at Kit Carson Park. When this pin is in the short position, it requires either a left-handed forehand shot – which is not in my arsenal – or a high, sweeping anhyzer to cover the fairway and land on the platform that houses the basket. The Atom handles it with ease. But the shot that really got me to put a ring on the Atom’s finger came just last week. Southern California’s signature Santa Ana winds graced us with their presence, and it wreaked havoc on my game. One drive left me way out from the basket on a 500-foot hole, facing a massive headwind for a roughly 200-foot approach. My score for the round was already terrible, so I decided to throw caution to the wind (pun intended) and really test the Atom’s abilities. I gave it a deep hyzer and it flipped up, rode the headwind high and never once thought about turning over. It sailed past the basket about 30 feet and even had a fade to it still, Santa Anas be damned. As it currently stands, the Atom is the only putter mold I need. It’s straight as an arrow in the circle, and I can put it on any angle, into any wind and – so long as I do my part – it performs. As a player who prefers fewer molds to take the thinking out of the equation, the Atom is phenomenal. The baseline plastic on the Atom may warp a bit on a tree hit (top) but is easy to work back into shape (bottom) while retaining its flight characteristics. It is also wearing in well, retaining most of its high speed stability and losing its low speed fade. This quality makes it extremely point-and-shoot; it’s like the DX Teebird of putters. 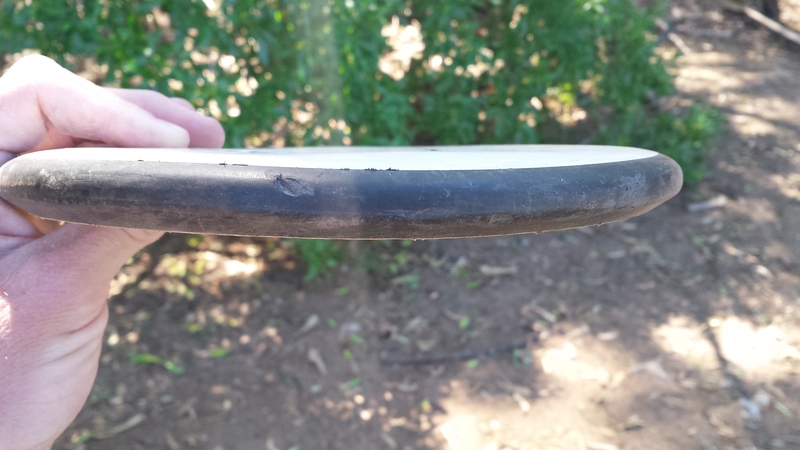 Sure, it’ll taco a bit on a tree hit, but a little muscle (obviously not a lot, as this is Noodle Arm Disc Golf you’re reading) will get it back into shape. 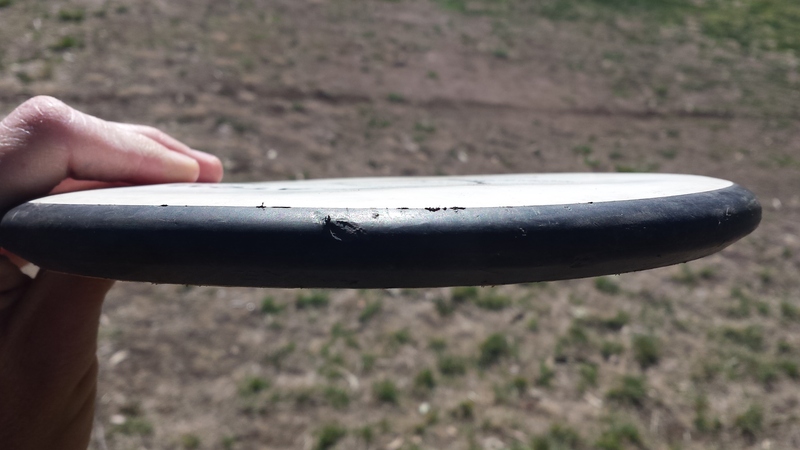 It reminds me of my BT Soft Harp from Westside Discs, in that it may look a little beat up, but it still maintains its flight characteristics. She may not be pretty in the hand, but in the air is where it counts. And she’s mine. But you can get your own, I won’t be (very) jealous. Great review Steve – Enjoying your site. Makes me want to write more myself! Great review of a great putter! Thank you for the site too! Hello Steve Hill! I won your MVP Atom pink disc from the dollar disc auction. Richard Gustin sent me. I was wondering what I should do at this point since I won? Please email me! Thanks Katelyn! Shoot me a message via the Facebook page or noodlearmdiscgolf@gmail.com and I’ll send it your way. Cheers!